What is driving the production and growth of edible insects market? Global human population is anticipated to increase by more than 2 billion by end of 2050 giving rise to food problem. Increase in food production will lead to more pressure on environment. So consumption of edible insects is one of the food alternatives through which one can get high quality protein, amino acids and vitamins at affordable costs.Edible insects possess high food conversion rate and emit less greenhouse gases than traditional livestock. Furthermore, insect farming is cost effective as compared to cattle farming. Also, these insects are considered as a protein source for direct human consumption. They can be nourished and nurtured in a natural environment.As per Global Market Insights reports, edible insects market size was evaluated at $33.1 million for 2015 and is anticipated to record higher than 40.1% CAGR by end of forecast timeline. Growing acceptance of bug consumption all across the globe is predicted to drive global edible insects industry trends. Today, there is rise in consumption of insects and bugs due to increasing health concerns among the global population. Bugs find their application in livestock like fish and poultry farms. It is projected that one hectare of land can produce minimum 151 tons of insect proteins every year. 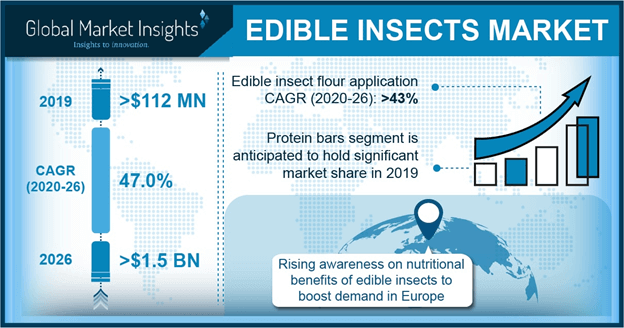 Awareness among the customers about fitness coupled with its growing use in food sector are the factors expected to drive the edible insects market expansion. Edible insects are rich in minerals and contain large amounts of potassium, iron, magnesium, sodium and zinc. Intake of diet rich in mineral content has a positive impact on fighting dreaded ailments. Eatable insects are main source of oils and fats and contain large proportions of polyunsaturated fatty acids. All these aspects are anticipated to expand edible insects market share during forecast timeline. Raw substance price is less that has resulted in enhancement in production and this directly affects edible insects market price trends. Cockroach oil is used as industrial lubricant or paint and this can provide new growth avenues for industry players to increase their product applications. However, edible insects can cause harm to health if they are harvested improperly. Limited regulations for edible insects can hinder industry expansion in future. Global industry is segmented into different products that include bees, scale insects & true bugs, beetles, wasps, caterpillars, ants and grasshoppers. Beetles segment contributed higher than $9 million for 2015 in terms of revenue. Substituting conventional source of protein like beef or chicken can promote the demand for beetle in coming years. Grasshoppers are considered as natural food and a rich protein source. The segment can expand substantially and is projected to record greater than 42.6% CAGR. These products are beneficial replacement for poultry and meat intake. Industry is segmented into applications like snacks, flour and protein bars. Snacks led the application segment and made a contribution of higher than $11.1 million for 2015. They are rich in amino acids, proteins, zinc, vitamins, calcium and potassium and these features can promote the segment expansion. Cricket based items are consumed as snacks as they are good for health and as they minimize carbohydrates and saturated fats. Protein bars is projected to record 42.1% CAGR during forecast timeline and cross $166 million mark. They are mainly utilized in preparing smoothies, biscuits, muffins, soups, breads and desserts. Flour applications include mealworm and cricket in powdered form. Other main applications of edible insects are chocolates, protein shake and pasta. Global edible insects market is segmented into Asia Pacific, North America, Middle East & Africa, Latin America and Europe. Asia Pacific industry, dominated by Thailand and China, was biggest region with higher than $10.1 million of revenue production for 2015. Europe edible insects industry is projected to experience heavy expansion during forecast timeline and is dominated by countries like France, UK and Holland. Latin America, dominated by Brazil, can expand substantially and Brazil edible insects market is anticipated to record 42.1% CAGR and surpass $55.1 million in terms of revenue during forecast timeframe. Key industry participants profiled in the report include Thailand Unique, AgriProtein Technologies, Gathr Foods, Crik Nutrition, Crickers, ECOBARS, Bugeater Foods, Entomo Farms, Proti-Farm and HaoCheng Mealworm Incorporation. This entry was posted in FOOD, NUTRITION AND ANIMAL FEED and tagged Ants, Bees, Beetles, Caterpillars, Edible Bugs, Edible Insect Industry, Edible Insects, Edible Insects Market, Edible Insects Market Share, Edible Insects Market Size, Edible Insects UK, Flour, Global Edible Insects Market, Grasshoppers, Protein Bars, Scale Insects, Snacks, True Bugs, Wasps, Worldwide Edible Insects Market Size. Over the recent years, the commercial drone/UAV market has garnered immense popularity owing to the substantial increase in civil applications of unmanned aerial vehicles. It is quite a well-known fact that the commercial utilization of unmanned aerial vehicles has been steadily rising since the early 1980s. However, a significant increase in investments and the relaxation of some regulatory norms across the globe have opened up an array of practical applications of drones across numerous business domains. This has, in consequence, acted as a pivotal factor in propelling the commercial drone/UAV market share in the recent times. In fact, as per a research report by Global Market Insights, Inc., the global commercial drone/UAV industry commanded a total valuation of over USD 2 billion in the year 2016. Boasting of a vast expanse of application spectrum, commercial drone/UAV market has gained extensive popularity over the past few years. As far as the wide-scale deployment of UAVs is concerned, the agriculture sector has emerged as one of the most lucrative end use segment of commercial drone/UAV industry in the recent times. It would be prudent to mention that drones are increasingly being utilized across agricultural fields in analyzing soil, assessing the health of crop, appropriate spraying of pesticides, planting of seeds, and irrigating the field throughout the crop cycle. In fact, the technological advancements in drones have made it easier to formulate a comprehensive 3D map for soil analysis which can aid farmers to seamlessly analyze seed planting patterns. Apparently, the aforementioned benefits of deploying drones in the agricultural sector have impelled the growth potential of commercial drone/UAV industry. Elaborating further, it has been observed that numerous leading commercial drone/UAV market participants have been forming robust alliances with government institutions to tap into the steadily evolving agricultural drones space. Citing an instance to highlight this trend, Parrot Drones has recently announced a share-cost initiative with the Technical Centre for Agriculture and Rural Cooperation (CTA) to use drones in the agriculture sector of the sub-Saharan African region. Reportedly, the announcement of the latest collaboration comes in the backdrop of Parrot’s recent launch of its thermal imaging drone, the Parrot Bluegrass, that is particularly designed for precision agriculture. The innovative drone is equipped with both a multispectral sensor and a video camera along with a unique processing cloud platform. For the record, CTA is a joint institution of European Union and the African, Caribbean, and Pacific Group of States which aims to enhance agricultural productivity in its member countries by precise resource management and ensuring food security. Needless to mention, the latest partnership comes on the heels of the overall commercial drone/UAV market in the African continent. Citing yet another instance of the technological advancement in the commercial drone/UAV industry, it has been reported that scientists in the UK have successfully grown the world’s first crop of barley by deploying drones. Apparently, the project was named as Hands Free Hectare, given that researchers automated agricultural machines by using drone technology and no agronomists set foot in the land utilized to grow the crop. Moreover, an autopilot drone was used to get the tractors working for seeding, harvesting, and monitoring purposes. 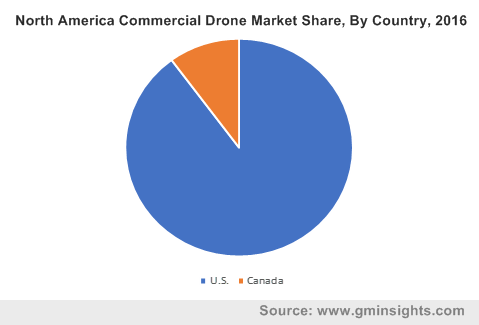 Considering the aforementioned instances which highlight the inventive usage of drones, the prospective growth of commercial drone/UAV market undoubtedly looks promising. With a marked increase in the number of collaborations between technology leaders, governments, and industry players, the utilization of drones is bound to witness a transformative change in the forthcoming years. Furthermore, the deployment of drones across various end use domains including Wildlife Research & Preservation, Aerial Photography, Inspection & Monitoring, Emergency Management, and Remote Sensing & Mapping has observed a substantial increase. All these factors are certain to positively influence the growth potential of commercial drone/UAV market, which is forecast to surpass a remuneration portfolio of more than USD 17 billion by 2024. This entry was posted in Sustainable & Smart Technologies and tagged Commercial Drone Market Size, Drone Market Forecast, Fixed Wing, Global Unmanned Aerial Vehicles Market, Hybrid, Nano Drone, Rotary Blade, UAV, UAV Drone Market, UAV Drones Market, Unmanned Aerial Vehicle, Unmanned Aerial Vehicles Drone Market, Unmanned Aerial Vehicles Industry, Unmanned Aerial Vehicles Market Forecast, Unmanned Aerial Vehicles Market Report, Unmanned Aerial Vehicles Market Revenue, Unmanned Aircraft. 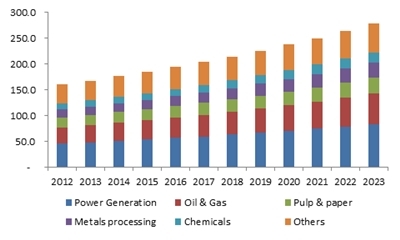 The massively increasing demand for renewable energy has served as a major boost to fuel cell market, the growth graph of which is projected to display a marked ascent over 2017-2024. It is prudent to note that a fuel cell is rather different from a battery – it is basically an electrochemical mechanism that can produce electricity through the combination of hydrogen and oxygen and is a renewable source of energy that keeps generating electricity as long as the combination of source fuels is available. As the fuel is not burnt in power generation, it is an unobtrusive process and truly pollution free with zero carbon dioxide emission, which is one of the principal concerns of most industry verticals worldwide. 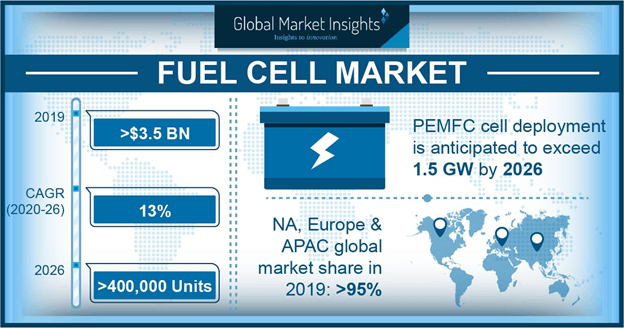 As governments in various nations are undertaking positive steps to decrease carbon dioxide emissions, fuel cell industry share is projected to climb exponentially high in the next few years. This entry was posted in Sustainable & Smart Technologies and tagged DMFC, Fuel Cell, Fuel Cell Energy, Fuel Cell Market, Fuel Cell Market Analysis, Fuel Cell Market Forecast, Fuel Cell Market Report, Fuel Cell Market Share, Fuel Cell Market Size, Fuel Cell Power, Hydrogen Cell, Hydrogen Fuel, Hydrogen Fuel Cell, Outlook, PEMFC, SOFC. Expansion of green corrosion inhibitors industry can witness a breakthrough in product techniques and demand. Increased use of corrosion inhibitors has led to correct steps being taken for its disposal. Inappropriate disposal adversely impacts the climate which can lead to instability in global corrosion inhibitors market price trends. 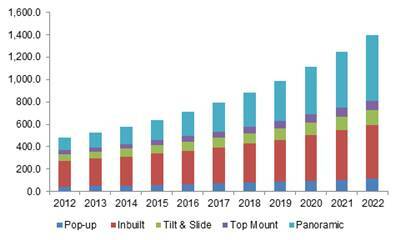 Solvent based application segment is projected to record CAGR of 4.3% by end of forecast timeline. These kind of applications make a protective barrier coating on surface of metal to avoid contact of water and thus prevents corrosion. Consistent performance of oil or solvent based application segment is a main aspect of segment growth. Asia Pacific, led by India and China corrosion inhibitors market share, is projected to witness more than $3 billion revenue growth by end of forecast period. Rapid industrialization in countries like India and China along with heavy requirement for minimizing maintenance prices to acquire competitive benefit is predicted to promote regional industry growth. Furthermore, heavy automobile production index in APAC promoted by product growth along with research & development activities are projected to propel industry growth in the region. Middle East & Africa and LATAM corrosion inhibitors market expansion is predicted to witness substantial growth during forecast timeline. This entry was posted in Bulk & Specialty Chemicals and tagged Application Potential, By Product, Competitive Market Share & Forecast, Corrosion Inhibitors Market Size By Application, Industry Analysis Report, Price Trends, Regional Outlook. Technological developments will chiefly influence the product demand and consumption trends. Global HIV diagnostics market share is estimated to surpass USD 5 billion by 2024. Low-and middle-income countries will be the top growth avenues for the industry participants. 2018 was undoubtedly one of the most remarkable years pertaining to the developments in HIV diagnostics industry. The year witnessed a slew of technological advancements and collaborations aiming toward ending the AIDS epidemic, which is rightly touted as one of the most serious health concerns worldwide. HIV related causes, as per the World Health Organization, claimed approximately 940 000 lives in 2017 globally. At the end of 2017, 36.9 million people worldwide were diagnosed living with HIV, a disease that has claimed almost 35 million lives so far. In recognition of this alarming morbidity and mortality rate, the global health community in tandem with the regulatory bodies are striving hard to provide effective treatments and diagnostic approaches accessible to the HIV-infected individuals world over. As per UNAIDS, low-and middle-income countries have the highest ratio of people living with HIV. In 2017, 53% of the overall HIV-infected patient base were living in eastern and southern Africa, 16% in western and central Africa, 14% in Asia, and 6% in western and central Europe and North America. The statistics are a validation to the penetration scope of HIV diagnostics market participants in the low-and middle-income countries. These countries undoubtedly can be one of the most prominent recipients of the POC self-tests diagnostic approach, given a large pool of population in these countries burdened with either the unawareness of the epidemic or lack of treatment accessibility. In 2018, Mylan N.V., the renowned generic and specialty pharmaceuticals company, made it to the headlines post its announcement of collaborative agreement with Atomo Diagnostics. The deal was announced as a strategy to make point of care rapid self-tests accessible in the low-and middle income economies wherein people can be more aware about their HIV status and seek treatment based on the results. As a part of the deal, Mylan received rights for the commercialization of CE-Marked in-vitro diagnostic tests in more than 100 countries across Asia, the Middle East, Africa, the CIS and Latin America. In a bid to achieve the elimination of AIDS and HIV from the country by 2030, KEMRI announced ITS collaboration with Swiss pharmaceutical giant, Roche to launch an advanced HIV testing laboratory. Dubbed as Cobas 8800, the new laboratory is claimed to test approximately 1 million people yearly. The launch is touted as one of its kind in terms of its rapidity, functionality, and accuracy. The deal also marked Kenya in the ranks of Uganda and South Africa which are the only African countries with Roche’s hi-tech HIV diagnostic laboratory. As per WHO, new HIV infections observed a decline of 36% between 2000-2017. During the same period, HIV related deaths fell by 38%, owing to ART (antiretroviral therapy). The numbers are undoubtedly a result of the conjoint efforts of the regulatory bodies as well as healthcare companies which are constantly developing accessible, convenient, and affordable POC tools to reach out to the HIV infected masses. In a bid to provide easy and accurate management of HIV, Abbott announced the launch of its new point-of-care test, dubbed m-PIMA HIV-1/2 VL. The new technique is said to be the first for POC based viral load measurement, delivering results within 70 minutes. The technique also supports decentralized programme management and can be used on the portable m-PIMA platform. The launch was another appreciable addition to Abbott’s rich HIV diagnostics solutions portfolio which spans across more than 120 countries worldwide, comprising all 55 African countries. The tool is claimed to play a significant role in achieving UNAIDS’ 90-90-90 goals. Toward the end of 2018, a new research from the Brigham and Women’s Hospital launched a tool to diagnose HIV with the help of smartphones, setting a new benchmark in the technology landscape of HIV diagnostics market. The tool which uses a cellphone and nanotechnology to identify the virus is highly portable, affordable, and accessible especially for resource-limited economies. As per reliable reports, the accuracy of the platform was within specificity of 99.1% and 94/6% sensitivity at the clinically relevant threshold of 1,000 virus particles per mL. Reportedly, the total cost of the entire setup was less than $5 per test, making it a highly economic tool in the low-income countries. Besides these developments, another pivotal factor that is estimated to drive the HIV diagnostics adoption and demand trends is the regulatory scenario. In fact, a favorable regulatory scenario along with the high-end healthcare infrastructure has made the U.S. one of the pivotal regions witnessing a rather profound expansion of HIV diagnostics market. As per a report by Global Market Insights, the U.S. HIV diagnostics market led the entire North America landscape, with a recorded share of USD 876.8 million in 2017. In the coming years, though the region will be one of the major growth pockets for HIV diagnostics market players, it is undeniable that the penetration rate would soar high in the emerging countries. 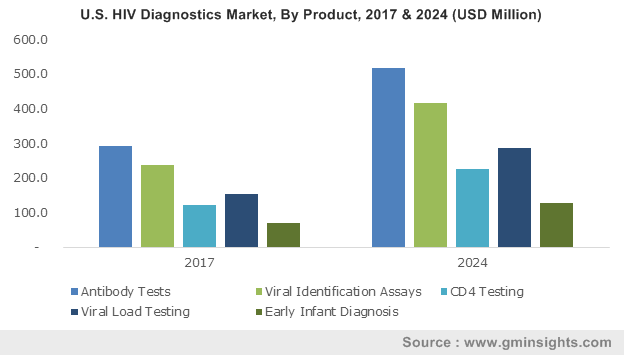 On a global scale, Global Market Insights forecasts the HIV diagnostics market share to surpass USD 5 billion by 2024. This entry was posted in Healthcare & Medical Devices and tagged AIDS Diagnosis, Antibody Test, Blood Antibody, CD4, Dried Blood Spot, Early Infant Diagnosis, EIA, ELISA, Flow Cytometric Instruments, Global HIV Diagnostics Market, Group O Test, HIV Diagnostics, HIV Diagnostics Industry Revenue, HIV Diagnostics Market Analysis, HIV Diagnostics Market Size, HIV Tests, HIV-1 Confirmatory Steps, HIV-1 Screening, HIV-2 Test, Home Access Dried Blood Spot, IIFA, Indirect Immunofluorescent Antibody Assay, Line Immunoassay, p24 Antigen, PoC Tests, Qualitative PCR, RadioImmuno Precipitation Assay, Rapid Test, RIPA, Viral Culture, Viral Identification Assay, Viral Load, Western Blot. Key industry participants profiled in the report include De Rigo SpA, Carl Zeiss AG, Silhouette International, Chemilens, Fielmann AG, Bausch & Lomb Incorporation, Cooper Vision, Marchon Eyewear, Hoya Corporation, Safilo Group S.p.A., Charmant Group, Alcon, Johnson & Johnson Vision Care, Marcolin Eyewear, Daemyung Optical CO, QSpex Technologies Incorporation, Vision-Ease Lens Incorporation, Luxottica Group S.p.A., Rodenstock GmbH, Essilor International S.A and Seiko Optical Products Company Limited. This entry was posted in Polymers and Advanced Materials and tagged Application Potential, Competitive Market Share & Forecast, Eyewear Market Size By Product, Industry Outlook Report, Price Trends, Regional Analysis.